The periodontal treatment depends on the severity of the periodontal disease. The successful therapy includes treatment, perfect oral hygiene and eliminating factors such as smoking and alcohol. 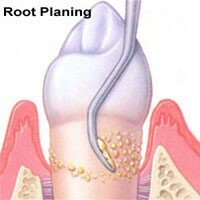 The treatment includes deep cleaning- removing the plaque and tartar and root planning. In some cases, antibiotics are also used. For the more severe periodontal diseases, surgical treatment is necessary. The surgical treatment includes flap surgery, gum graft surgery, regenerative procedures, laser treatment, bone and tissue grafts and more.